CPR alone is only successful 3 to 4% of the time. (A 1996 study by the New England Journal of Medicine showed that in television shows CPR was portrayed as successful 75% of the time.) CPR is crucial to keep enough oxygen to the brain until more advanced life support can get to the victim. 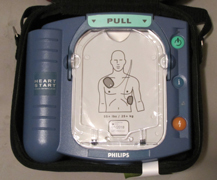 That advanced life support is mainly an Automated External Defibrillator (AED). AEDs aren’t just for adults. As of a 2004 study, over 300 children were dying yearly from preventable sudden cardiac arrest (SCA) while playing sports.